Hybrid bike made for cruising: Read review of Giant Roam. Giant Roam is a commuter slash utility bike for riders who also love to take detours. The bike model is highly affordable and offers a number of perks over typical commuter bikes. It’s great for people who seek practicality as well as fun with their everyday bikes. We are all quite familiar with Giant bikes thanks to their affordability. We wrote this review with that in mind. Giant bikes, in general, have similar price tags, wheelsets and tires. So it can be quite hard to determine which is better suitable or which need. Roam, however, is clear in what its intended for. 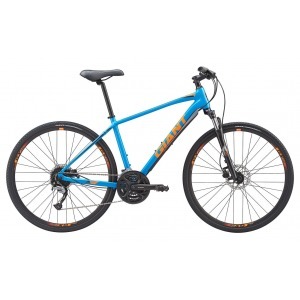 Giant Roam is intended for urban commuting as well as entry-level to moderate off-road trips. It’s important to understand this. If you want only an off-road bike, this model will disappoint. If you only want a utility bike for getting to and from work every day, this model has unnecessary features that you won’t need. But if you are into both, this is definitely the bike model for you. This model has ALUXX aluminium frames with 700cc wheels. This frame is designed to last. The wheels are sturdy, offers excellent traction and can maintain fast speeds without a problem. The trickiest design choice here is the suspension fork and the handlebar that is very akin to those on pro mountain bikes. In the city, you really don’t need a front suspension like that. But it’s handy in the wild. The front suspension can make city riding a bit troublesome. The Seek for example, has a hydraulic break that’s useful in the city. This model is more expensive in comparison, but you definitely get ore functionality out of it. Giant Roam is not exactly universally beloved, but we highly recommend it for riders who want practicality. The front suspension can make city riding a bit troublesome at first. Then you get used to it as you gain more experience. Even in citifies, there will be rough terrain with changing elevations. That’s where a bike model like this one comes in handy.